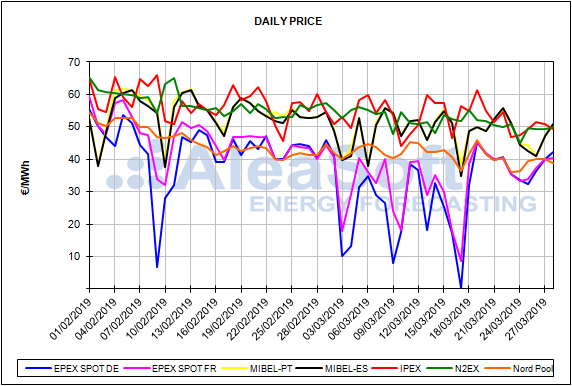 The daily average price of the MIBEL electricity market of Spain and Portugal, which was most of the week of March 25 between 40 €/MWh and 45 €/MWh, rose on Thursday, March 28, to 50.83 €/MWh, positioning itself as the highest among the main European electricity markets that day. 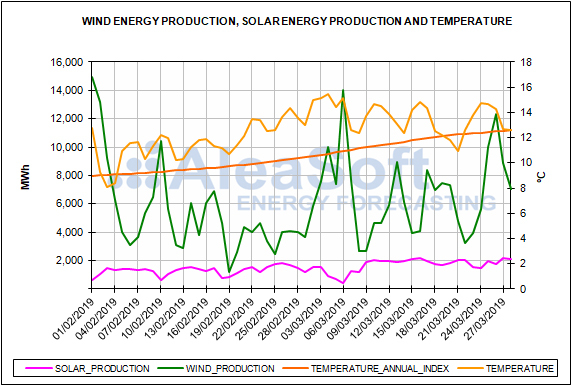 According to the AleaSoft´s analysis, in the first three days of this week the Spanish wind energy production was between 200 GWh and 300 GWh per day, while the forecast for today, March 28, is around 160 GWh, which propitiated the increase in prices. However, the average price of the first four days of this week fell by 9.1% in the case of Spain and 8.1% in the case of Portugal, if compared with the corresponding days of last week. This week the European electricity markets were grouped in two stripes according to their price. The EPEX SPOT markets of Germany, France, Belgium and the Netherlands, and the Nordic Nord Pool market are located in the strip with prices or around 40 €/MWh. 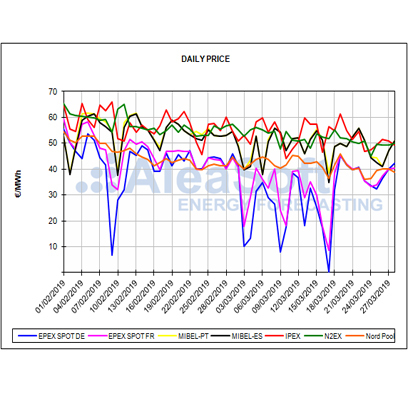 In the highest price strip, around 50 €/MWh, there are the Italian IPEX and the British N2EX markets. And the MIBEL market was oscillating between the two strips, with prices between 40 €/MWh and 50 €/MWh. The European markets prices continue to drop this week, from the 4.6% of the EPEX SPOT Germany market to the 9.9% of the EPEX SPOT Belgium market, if compared with the average price of the first four days of last week. So far this week, electricity demand in Europe fell compared to last week since temperatures have risen with the spring arrival. The wind energy production was higher this week at European level, while the solar energy production increased in Spain but decreased in Germany and Italy. 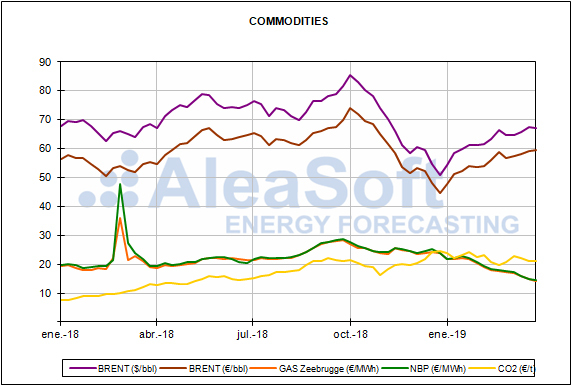 The price of Brent oil futures in the ICE futures market for the month of May 2019 remained below 68 $/bbl this week of March 25, settling at 67.83 $/bbl in the session of March 27. 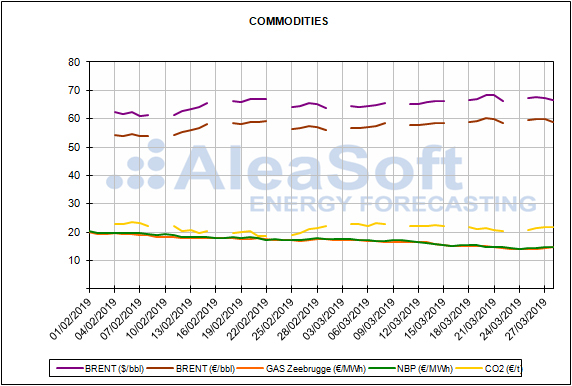 Although some of the events that led to the Brent price increase, for example, the OPEC production cuts and the sanctions imposed by the United States on Venezuela and Iran, remain in force, in AleaSoft it is expected that in the coming days the price will remain below this level of 68 $/bbl. 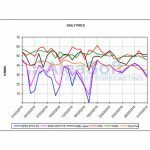 This week, the price of TTF gas futures for April in the ICE market slowed down the downward trend of the last six months and in the session on March 27 settled at 14.99 €/MWh, 5.7% higher than in the session of Monday, March 25, when it settled at the lowest value of the last two years, of 14.19 €/MWh. According to AleaSoft, gas prices will return to the decreasing trend, although we must be aware of the situation of political instability in Algeria, a large gas supplier to southern Europe. On the other hand, the API 2 coal futures for April in the ICE market continue with the bearish trend of the last six months. Yesterday, March 27, the settlement price was 63.20 $/t, a value that was not reached since the end of May 2017. In AleaSoft, the price is expected to continue falling, with the possibility of reaching 60 $/t in the upcoming weeks. The futures of CO2 emission rights in the EEX market for the reference contract of December 2019 reached once again prices above 21 €/t this week, after last week they ended below that value. In the session of March 27 they settled at 21.86 €/t. The evolution of the coming days and weeks will depend to a large extent on the Brexit negotiations. In AleaSoft it is expected that they could go below 20 €/t if the United Kingdom leaves the European Union. 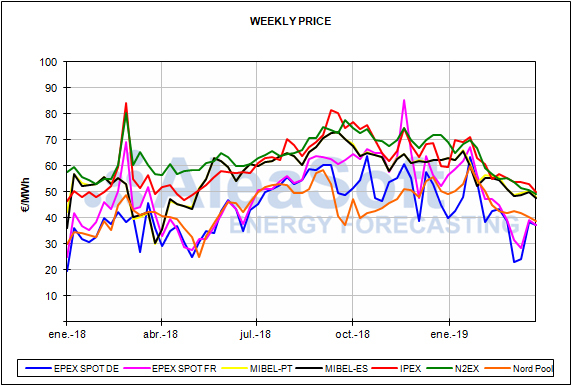 The electricity futures of Spain in the OMIP and EEX markets for calendar 2020 increased by 0.9% between the sessions of March 22 and 27, reaching 53.75 €/MWh in OMIP and 53.68 €/MWh in EEX. The same rise experienced the futures of Portugal in the OMIP market for the same product and period, settling yesterday, March 27, at 53.78 €/MWh. The futures of France and Germany in the EEX market for calendar 2020 also rose, in both cases stronger than those of Spain and Portugal. French futures settled yesterday, March 27, at 50.41 €/MWh, 3.0% higher than in Friday, March 22, session, while in Germany the rise in the same period was 3.9%, with a settlement price of 46.93 €/MWh in yesterday’s session. This week the average temperature of mainland Spain is being higher than last week, which favoured the electricity demand to decrease. 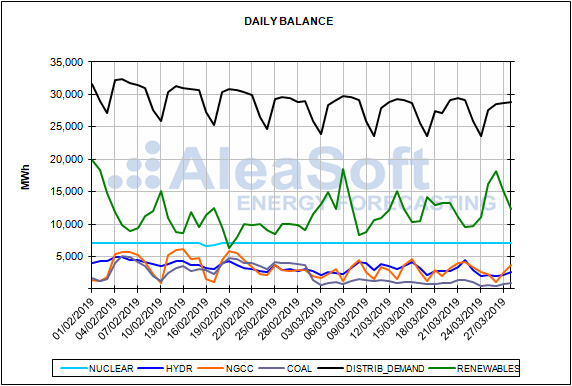 According to the calculations made by AleaSoft, once the effect of the regional holiday on March 19 was corrected, the electricity demand between March 25 and 27 was 1.0% lower than the first three days of last week. The wind energy production this week increased by 85% compared to last week. 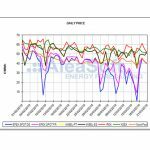 In AleaSoft it is expected that next week the production with this technology will fall compared to the values of this week. The solar energy production, which includes photovoltaic and solar thermal technologies, increased 11% so far this week, compared to the values of last week. 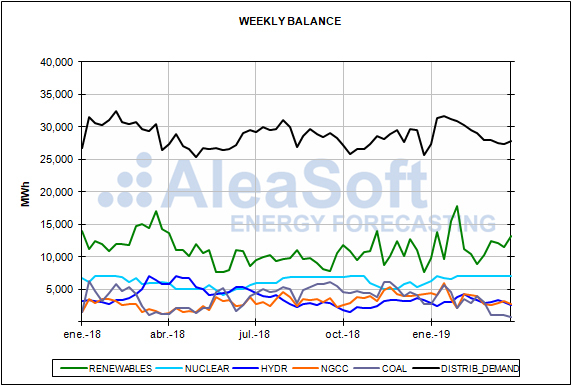 According AleaSoft´s forecasts, next week solar energy production may fall, although the general trend is to increase as the sunshine hours increase. This week, all the nuclear power plants continue operating normally and the hydroelectric production has been around 50 GWh per day, lower than the previous week when it was above 66 GWh per day most of the week. 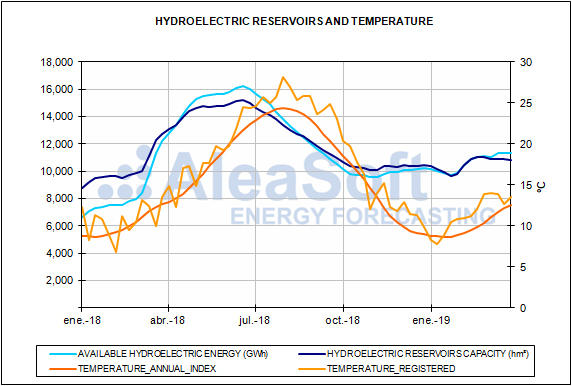 According to the Hydrological Bulletin published by the Ministry for the Ecological Transition, hydroelectric reserves decreased 48 GWh during the last week, currently amounting to 11 289 GWh, a value that represents a 49% of the total capacity.